Symthic Forum was shut down on January 11th, 2019. You're viewing an archive of this page from 2019-01-08 at 22:29. Thank you all for your support! Please get in touch via the Curse help desk if you need any support using this archive. So. the Auto-8 .35 Factory, compared to the Marksman, has 7.16% lower V-Recoil after its 5th shot, and then resets to 0 ~0.23s faster. The pre-patch Luger 1906 Factory, compared to its new Optical-self, had 7.62% lower V-Recoil after its 5th shot, and then resets to 0 in... 0.25s? It's off the chart as recovery is still not done after 100 frames. *edited to add* Also, it was reported that ANY mouse movement would stop Recoil Decrease in BF4. I wonder if that is still the case? Add Optical sight and change weapon name, keep player stats attached. Add Factory (and MM) as new weapon, everyone starts from zero there. 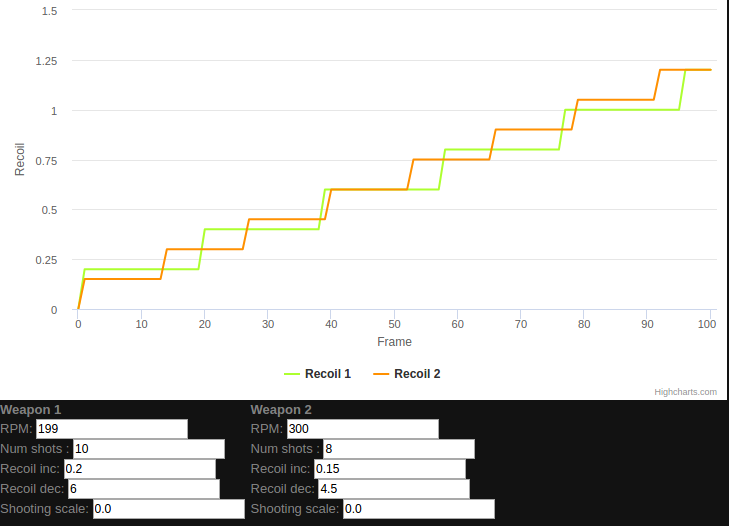 Using the previously posted calculator, it actually seems like the recoil decrease of SLRs will be ever so slightly worse if my numbers are correct. More recoil but much faster settling. Fixed rather embarrassing bug in the recoil decrease plotter. Last time I checked, 0.4*5 did not equal to ~1.67 . Fixed now though. leptis - Analysis of shotguns, recoil, recoil control and air drag. Veritable - Scoring of BF4/BF1 firearms in terms of usability, firing and other mechanics. pmax - Statistical analysis of BF4 players/games. Miffyli - Random statistical analysis of BF4 battlereports/players and kill-distances. (list is cluttered with other threads). Just want to clarify one thing about the Rdec image in the 1st post. The graph is showing cumulative recoil right? I wonder how they came up with the constants and why they do not want to keep the increasing Rdec with time since last shot. Probably because they didn't like recoil decrease accelerating then suddenly stopping. Having it slow down to where it should be probably looks a lot more natural. Passive Spotting is the future! "Skill" may indeed be the most magical of words. Chant it well enough and any desire can be yours. If it flies, it diesÂ. Not so clever person here, trying to learn the shooting mechanics as I'm fascinated by them.